The shooting at Parkland School was horrible. I have not met anyone who wasn’t deeply saddened by the massacre and is searching for a solution to protect our kids from gun violence. And for you liberals screaming about the NRA you are wrong, the NRA is also searching for ways to protect our kids. I happen to believe we need to tighten background checks to prevent sociopaths like Nikolas Cruz from buying one gun (he bought ten). I also think we need to develop a better communication system between law enforcement agencies not only to prevent warnings such as the ones made about Cruz to fall through the cracks but to require more stringent background checks for people whose mother called the cops on them 20x. Finally, I believe we need to create a program to arm teachers like they do in Israel, or to put more than a single armed guard in schools. Every time someone recommends armed guards in schools a liberal is there to call it stupid or pandering to the “gun lobby.” I wonder how they would feel if they knew the first president to suggest armed school guards. Because it was almost eighteen years ago then-president Bill Clinton, suggested putting armed cops (or other trained armed guards) in schools. In April 2000 as part of his commemoration of the first anniversary of deaths at Columbine High School in his weekly radio speech President Bubba announced $120 million in grants, half of which were for a program to place police officers with guns in schools. “In our national struggle against youth violence we must not fail our children; our future depends on it,” the president said in his weekly radio address. Parents, teens, teachers, youth workers and others will discuss research that indicates the preteen years set patterns for behavior and success in adulthood. Other subjects will include the risks, challenges and anxieties faced by young people today and what can be done to avoid dangerous or risky behavior. “We need to talk about safety and security in every house in America,” Clinton said. (…) Clinton also unveiled the $60-million fifth round of funding for “COPS in School,” a Justice Department program that helps pay the costs of placing police officers in schools to help make them safer for students and teachers. The money will be used to provide 452 officers in schools in more than 220 communities. “Already, it has placed 2,200 officers in more than 1,000 communities across our nation, where they are heightening school safety as well as coaching sports and acting as mentors and mediators for kids in need,” Clinton said. SHHHHH! 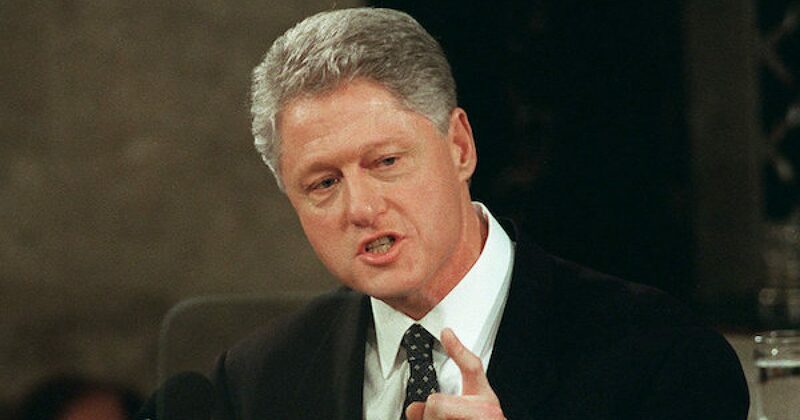 Please don’t tell the liberals that Bill Clinton supported putting armed cops in schools It might cause their heads to explode…or even worse It might make them to think of other ways to protect our kids without simply calling the NRA and conservatives evil, and politicizing the issue.